You are currently browsing the Carpe DMM blog archives for December, 2013. 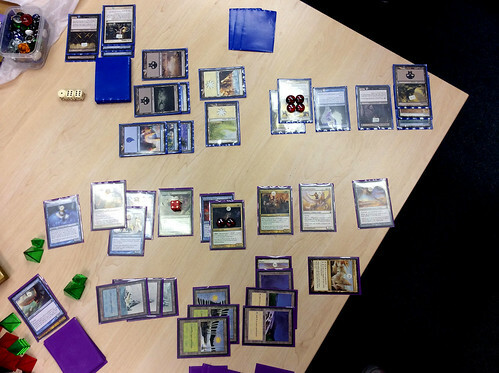 I played the most epic game of Magic: The Gathering of my life today. We are playing a draft tournament with the latest set, Theros, which is based on Greek mythology. One of the design goals for the set ( as explained by Mark Rosewater in one of his excellent game design articles) was to capture the feel of epic conflicts between mighty heroes and powerful monsters. I think they succeeded. The draft has seven players, and we play a full round-robin of 3-game matches, scoring one point per game win (we play the full 3 games, even if one player is up 2-0 after 2 games). Currently three of us are tied on 11 points, with two others on 10 points. Only a few games are left to play, and it’s possible for all 5 of us to end on 11 points. Prior to today, I had two games to play, and so the most opportunities to break away from the pack. I began my second last game of the tournament against Loki, who I had beaten in our first game. He tossed out a few cheap creatures early on and attacked until I was down to 13 life, at which point I had accumulated enough land to play some slightly larger creatures and shut down his attack. I had a Nessian Asp in hand, and had drawn a Fleecemane Lion, which is a potential game winner once it activates its Monstrous ability. But before I played the Lion Loki put out a Triad of Fates, which was capable of removing the Lion before it could become Monstrous. So I bided my time and hoped to draw enough land to put it into play and make it Monstrous on the same turn, thus activating its Hexproof and Indestructible abilities and making it safe. I also had out Triton, Fortune Hunter, and was targeting it with stuff to draw extra cards as often as I could. Unfortunately, as well as the Triad, Loki played a Fabled Hero, and buffed it up with auras, creating a large double striking creature, as well as a regenerating creature and one or two other small creatures. I also had a few other creatures. The result was a massive stand-off, with neither of us able to attack effectively, and if we did we would leave a hole in our own defences, so we played several turns in a row with no attacks. I played Spear of Heliod, giving all my creatures +1/+1, and giving me a weapon to destroy any creature of Loki’s that managed to do damage to me, making it even less likely that he would want to attack me. I drew what I thought would break the game open, Medomai the Ageless. Loki had no flying blockers, so I attacked with Medomai the next turn and gained an extra turn…. but with the extra turn I had nothing effective to do, so simply untapped and drew a card, then passed the turn to Loki. By this time he had put a Triad of Fates counter on Medomai, and then exiled it, allowing me to draw two more cards, but removing the threat. His Fabled Hero has grown quite large by now, being 6/6 double strike, almost enough to kill me in a single unblocked attack. What’s worse, it was enchanted with Erebos’s Emissary, allowing it to get +2/+2 every time Loki discarded a creature from his hand, so I couldn’t afford to let it go unblocked. Fortunately, I had more than enough blockers to deal with it, and the Spear of Heliod meant that if he did damage me without killing me I could destroy the Hero, so he didn’t attack. At some point I had enough mana spare to make my Nessian Asp Monstrous, making it 9/10 with the Spear bonus, which just increased the stand-off to truly epic proportions. Loki used his Triad of Fates on his own smaller creatures a few times to draw more cards, but I was drawing faster thanks to several spell effects combined with the Triton. I got out a Prescient Chimera and managed to get Loki down to 13 life also before he exiled it with his Triad. At this point I started to think the game might possibly go down to who ran out of cards first, as neither of us looked like making a combat breakthrough. But I knew I had an Aqueous Form in my deck, so I was burning through it as fast as I could to find it. That would make my Lion or Asp unblockable and be able to kill Loki within two turns. I didn’t know at this stage, but Loki informed me afterwards, that he was trying to draw cards as fast as he could too, seeking a card that would break the deadlock from his side. I cast Hopeful Eidolon, bestowing it on my Triton, triggering another card draw for myself and hoping the turn the Triton into a 4/4 creature with Lifelink. Gaining 4 life whenever it did damage would have been very helpful, and (in hindsight) probably would have won the game for me, but unfortunately for me Loki had an Annul in his hand and countered the spell, putting the Eidolon straight into my graveyard, meaning its life gain ability was out of my reach. A turn or two later Loki cast a Nimbus Naiad, bestowing it on his Fabled Hero. This would make the Hero 11/11 flying, double strike, which was enough to kill my Nessian Asp – the only large creature I had that could block flyers (it has Reach). Fortunately I also had an Annul, and sent the Naiad straight to the graveyard. We stalled for a few more turns. Loki bestowed another Nimbus Naiad on his Fabled Hero, and this time I had no Annul to counter it. I was in trouble – it was 11/11 flying double strike, big enough to kill my Nessian Asp without dying. Without an answer I would be dead in probably 2 more turns. On my turn I drew Sea God’s Revenge. This was a card that could not only save me from the Fabled Hero, it could win the game for me that turn! By removing three of Loki’s creatures, I would leave him with not enough blockers to stop a fatal attack from all my creatures. I cast it, targeting his Triad, his Fabled Hero, and another smaller creature. But Loki had a Gods Willing, and cast it to give his Fabled Hero protection from blue, making it an invalid target for the Sea God’s Revenge. However, this had the side effect of also making it an invalid target for the Nimbus Naiad, and it fell off, becoming a creature (after a rapid check of the rulings to see if it actually became a creature or went straight to the graveyard as a result of falling off due to colour protection effect) and leaving the Hero as 9/9 double strike, no longer with flying – making it again easy for me to block if it attacked. This gave Loki two more blockers than I had reckoned when I cast the Revenge, so I could no longer attack for the kill. Attacking would have left me vulnerable to a potentially game-losing counter-attack, so I declined to attack. And so the game continued. Loki recast the Triad soon after, but kept the other small creature in his hand. He used the Triad again to exile another of his small and unnecessary creatures (his large ones were holding down the fort and making it impossible for me to attack him usefully) to draw two more cards. Eventually, with my library down to just 6 cards, I drew the Aqueous Form I had been waiting for. My Asp was not big enough to kill Loki in a single blow, so I placed it on the Fleecemane Lion, lest Loki destroy the Asp before it could finish the job. The Lion was much, much harder to deal with. (Loki informed me after the game that I had made a very good decision here, because he had in his hand Voyage’s End, which returns a target creature to its owner’s hand – it would return the Asp to my hand and the Aqueous Form would have been destroyed. If I’d enchanted the Asp, I would have lost the game because of that decision.) I attacked, and got Loki to within a single strike of my now unblockable Lion. I would win on my next turn. Loki had no responses that could deal with it. He took his turn, drew his card, hoping it would be something that could get hi out of this desperate situation. It was Thassa’s Bounty. He could draw three more cards! The other effect of the spell was to mill three cards off my library into my graveyard, leaving me with just three cards in my library. One of the cards Loki drew into was Prowler’s Helm. He cast it, and equipped it onto his Fabled Hero, making it unblockable, since I had no Walls. It was 9/9 double strike, and I was on 13 life. I was dead. But then I remembered the Spear of Heliod! After the first strike damage of 9 was assigned to me, I could activate the Spear to destroy the creature that had damaged me, the Fabled Hero, before it could deal the extra 9 points of regular damage! I would survive the turn, then hit Loki with my unblockable Lion for the win! But Loki saw this. He discarded a creature from his hand to activate the Erebos’s Emissary (the very creature I had made him return to his hand several turns earlier with Sea God’s Revenge! If I hadn’t done that, he would not have been able to make this play) giving the Hero +2/+2, making it 11/11. If he could just discard another creature, he could make it 13/13, and kill me with the first strike damage alone, before the Spear could kill the Hero. But he had no other creature in his hand of three cards! But then he saw that he had that Voyage’s End. “Return target creature to its owner’s hand.” This spell is almost always used to remove an opponent’s creature temporarily. But he cast it on one of his own creatures (using the last two mana he had available – he had tapped most of his land already casting the other spells to get him to this point), returned the creature to his hand, then discarded it to activate Erebos’s Emissary again, giving the Hero another +2/+2, making it 13/13… enough to kill me with first striking damage. Loki has exhausted his entire set of resources – all his mana, all his card drawing effects, every useful card in his hand – to get to this point where he had an unblockable creature exactly large enough to kill me in one blow, immediately before that strike gave me the opportunity to kill it with one of my open threats on the table. If anything had gone wrong, if I had any response whatsoever that could deal with this creature, prevent a single point of damage, or gain me just one point of life, I would have survived, and then swung back with my massive unblockable Lion for the win. But I had exhausted my deck and my hand. So I lost the game. I would have won on my very next turn, with just 2 cards left in my library… but Loki’s amazing last turn spun the whole game on its head and pulled out an incredible win. We both agreed (along with Steven who was watching the final stages of the game) that it was the most epic game of Magic ever played. It was like a wrestling match, in which both wrestlers are flexing and bulging muscles, looking for any vulnerability or moment of weakness, probing for that single slip that they can exploit to full advantage, but every time something appeared to give, the other person propped it up again, reinforcing the unbreakable resolve. Several times not just once, twice, three times, but many times, we played spells that seemed destined to crack the standoff and provide a winning advantage, and every time the opponent had an answer that rose to the occasions and reset the deadlock at an even mightier level of power. In the end it took a truly epic turn to combine the effects of four separate cards to construct a winning scenario for Loki, in the face of losing the very next turn. The whole game felt like an altered state of awareness in which it was just us locked in this gargantuan tussle. I never at any stage felt confident that I would win, but likewise never felt like I was doomed to lose or even battling uphill. It was an irresistible force meeting an immovable object. Loki and I are now locked at one game each in our match of three. It is possible that whoever wins that game will win the entire tournament. It should be a suitable finale for a fantastic tournament. I was at my last drum lesson for the year last night, and I mentioned that I was trying to get the guys together for some more band practice over the Christmas/New Year period. In a year and a half we’ve so far only managed to actually get together as a group and play songs twice, which is pretty miserable – though understandable given most of them are busy parents with young kids and so on. My teacher suggested that I could try joining the music school’s adult band program. They actually have two different programs: they match you up with other people who play different instruments according to your tastes in music, then they either give you a set list of about ten songs to learn, or they let you pick your own songs. You attend a roughly 2-hour practice session at the school once a week for some number of weeks, which is attended by a teacher who helps everyone with the songs. And then at the end they book you into a pub to play an actual gig! 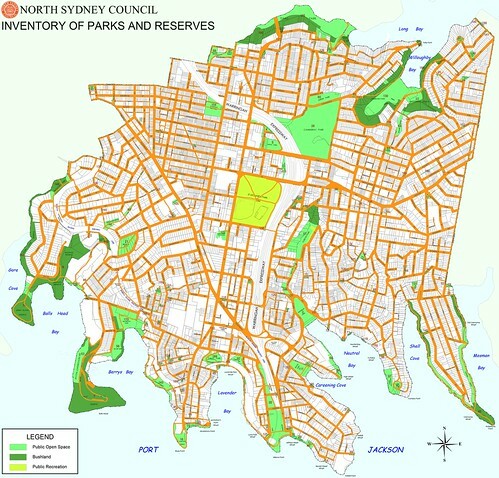 I mentioned in this post back in June that my wife and I were doing a walking project: walking the full length of every street and walking path in the North Sydney council area. The area is roughly 4km by 4km, so that’s a fair bit of walking. Every trip has to start and end at our home as well – no driving to and from places on the other side of the area to walk there. We started this project in (I think) March of 2011. I thought at the time we might be able to finish it within a year. But it turned out to take more than two and a half years. It feels good to complete such an ambitious and long-running project. We’ve thought about starting a new one… walking every street and path in the Sydney City council area. For that one we’ll probably have to allow ourselves to catch a train or bus to and from the walking locations.